(CNN) -- Google Wave, a product that promises to revolutionize online communication, will go out to about 100,000 beta testers Wednesday. 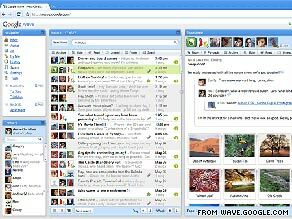 Google Wave hopes to replace e-mail as the main way people communicate online. The Web application from Google Inc. combines elements of e-mail, chat, Wiki documents, blogs and photo-sharing sites to create a form of Internet communication called a "hosted conversation," or a "wave." Google demonstrated Wave at the Google I/O developer conference in San Francisco, California, in May. The closed group of beta testers will help Google fish bugs out of the application before a public release by the end of the year, according to the Google Wave Web site. The app was created by Jens and Lars Rasmussen, the brothers who developed Google Maps. The Rasmussen brothers said they hope Google Wave will eventually replace e-mail as the main way people converse on the Internet. "This should be something everybody uses and something everybody knows," Jens Rasmussen said. In Wave, e-mail-like communications can be edited by several users simultaneously. And users can chat about certain sections of Wave documents in real time, where all users see what a person is typing as it is typed. If a person comes to the conversation late, they can replay everything they've missed. The Rasmussens hope these functions will make online communication more efficient and collaborative. Jens Rasmussen said e-mail is a computer version of snail mail. Wave will be something new, a real-time communication system designed specifically for today's faster-paced, multitasking Internet, he said. "We really have a much too strong tendency to just take things we know and just adapt them to the digital world," he said. Tech bloggers have largely cheered the release of the product. But there are some concerns that the app may be too complicated for mainstream Web users. In a video demonstration, the Rasmussens spend an hour and 20 minutes explaining Wave. Initial reviews of Wave also noted a number of glitches in the application. Ben Parr of the social-media blog Mashable writes that Wave still has bugs but that the product is improving over time. "As an initial user of Wave, I have to tell you: things have gotten much more stable. It still has a slow response time in certain situations and it can still crash, but these things happen far less often than they used to," he writes. The blog TechCrunch wrote that Wave "drips with ambition" and will be "a new communication platform for a new Web." "Wave offers a very sleek and easy way to navigate and participate in communication on the Web that makes both email and instant messaging look stale," TechCrunch's MG Siegler wrote.